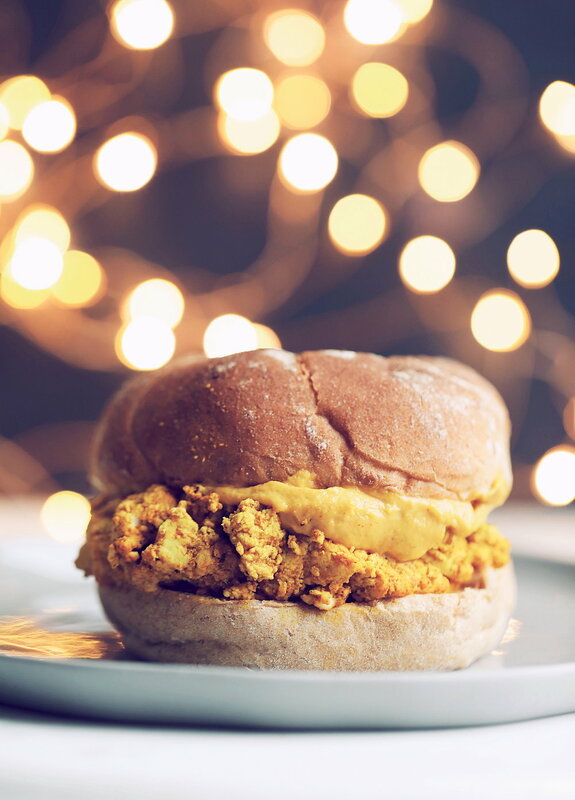 This vegan breakfast sandwich is a classic comfort food which features a savory tofu scramble and a homemade cashew “cheddar” cheese spread. This melty, stretchy cheese spread also makes the perfect vegan grilled cheese! Sometimes, you just need a savory breakfast that’s a little extra indulgent and comforting, and this breakfast sandwich will definitely hit the spot. When I went vegan, I thought I’d never get to enjoy anything like a breakfast sandwich ever again, but over time I learned that it’s possible to make a vegan substitute for just about anything, including the classic egg and cheddar filled sandwich. Many years ago when I was living in NYC, I needed a cheap breakfast which could keep me full all day through my busy schedule. Once I discovered there were bodegas on every corner serving up egg and cheese sandwiches, breakfast sandwiches became my everyday meal. These days, since becoming vegan and more health-conscious, I tend to stick to oatmeal topped with nuts or seeds and fresh fruit. While this is great most of the time, I still occasionally have days where all I want is something as filling and satisfying as a classic breakfast sandwich. Since it was not specifically the greasy eggs and cheese that I missed, I knew I could make a vegan version which had a similar texture and flavor that would make for an equally delicious sandwich. Tofu scramble doesn’t need to be complicated. I’ve tried many scramble recipes which include chopped onions, garlic, peppers, mushrooms, and all sorts of add-ins, and while those scrambles make for great meals on their own, for this sandwich recipe I like to use a simplified version which is more versatile like classic scrambled eggs. I like to mix all the spices together in a bowl and then add in a splash of water to make a spice paste. Pouring over the spices in the form of a paste allows for the spices to marinate the tofu in the pan rather than just cling to the outside of the tofu. Once you have your spice paste mixed, it takes just 5-7 minutes to brown the crumbled tofu in a pan, then add in the paste and cook for a few more minutes. This scramble recipe is so quick and easy! When I’d order my breakfast sandwiches at my local bodega, I’d always specifically ask for cheddar cheese. 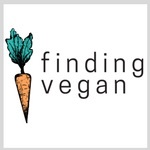 I loved the sharp tangy flavor on a breakfast sandwich, and to me any vegan version would be incomplete without a realistic cheddar substitute. While I normally avoid nut-heavy vegan cheese replacements, a vegetable-based sauce would just not cut it here for a cheddar cheese replacement. I’ve found that cashews are the way to go for the best spreadable, melty, homemade vegan cheese. This cheddar cheese spread is perfect for grilled cheese sandwiches too! It can also be thinned out and made into a mac and cheese sauce (it reminded me so much of Velveeta!) but I still prefer my cheesy vegetable-based sauces more for pasta. 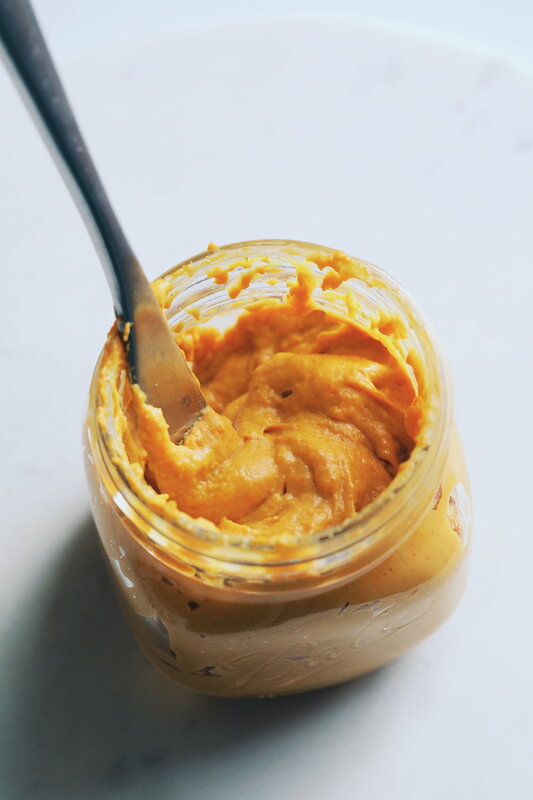 If you are looking for a spreadable vegan cheddar that you can make at home, this is the perfect recipe! Soak your cashews first if not using a high-speed blender. Then add all of the cheese ingredients into a blender and blend until completely smooth. Pour this mixture into a pan over medium heat and stir for a few minutes until it thickens. Scoop this mixture into a jar or other sealed container and store in the fridge until ready to use. This will keep for 7-10 days. You can warm it up before using it or just spread it on the sandwich as is, since the warm scramble and toasted bread will heat it up. No matter the temperature, the texture will stay quite thick and melty, very similar to actual melted cheddar cheese. 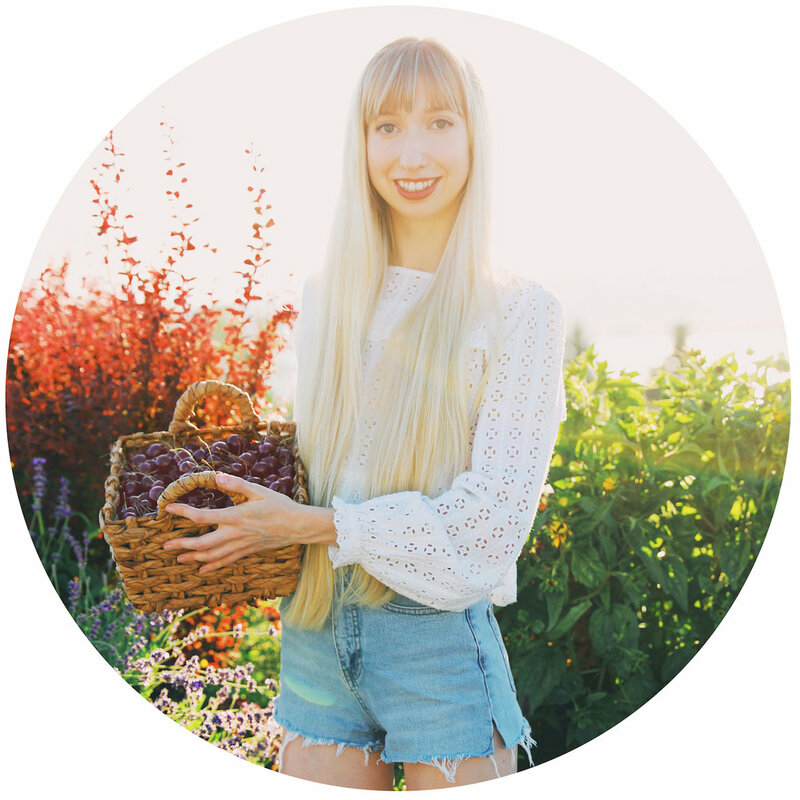 If giving up cheese is the one thing holding you back from trying out a plant-based diet, definitely give this vegan cheese recipe a try! While you could pile this sandwich high with toppings such as mushroom bacon, sliced avocado, tomato, onions, or spinach, you could also just stick to the classic “egg and cheese on a roll.” Serve it on a biscuit, english muffin, whole grain bread, or even throw it all in a wrap for something different. 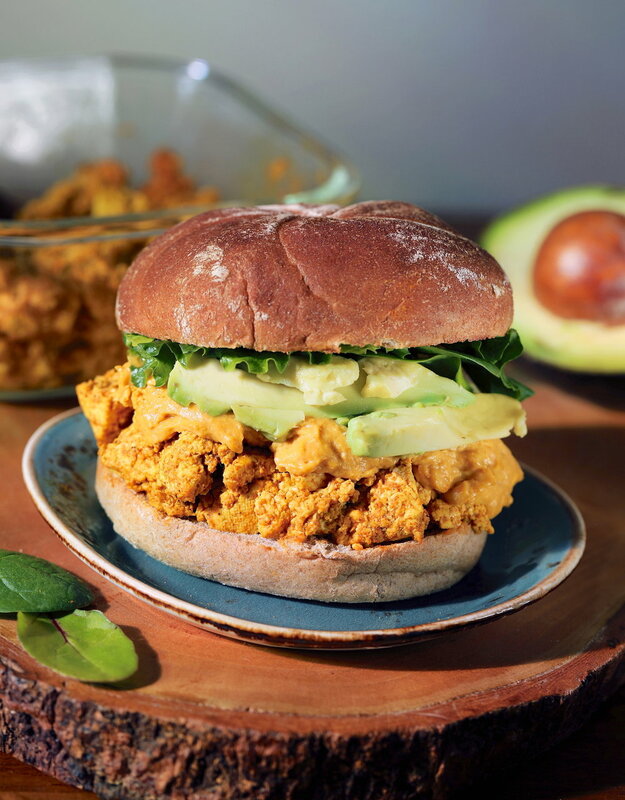 Both the scramble recipe and the vegan cheddar recipe are so versatile and can be used to make a variety of other meals as well, so make a large batch and have a fun week of cheesy sandwiches! For a super-easy version, check out the recipe notes for an alternative recipe which uses slices of marinated tofu instead of tofu scramble. It’s also a bit less messy and easier to take on the go. I make that version more often than the scramble, but both are so good. I hope you love this vegan breakfast sandwich!